Popcorn is yummy, but it can also look fantastic! 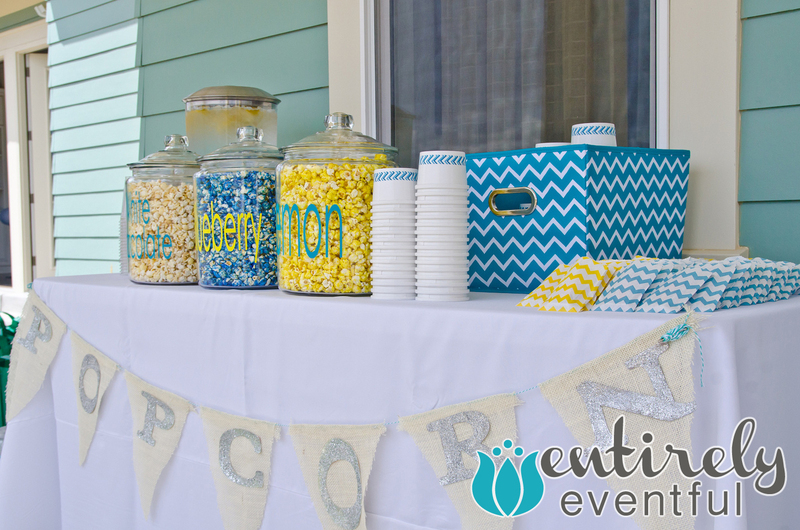 Here is an example of how we do popcorn at Entirely Eventful. You might notice the signage! It's made with burlap, hand-glittered letters, and baker's twine. This fabulous popcorn bar included lemon, blueberry, and white chocolate candied popcorn. We decorated the plain paper cups with some fun washi tape in our color scheme. We also had lemon-infused water available to cut down the sweetness. The little chevron print bags on the right were filled with decorative gum packs.